Found one file extension association related to Office Profile Wizard and 1 file format developed specifically for use with Office Profile Wizard. The Office Profile Wizard helps you to create and distribute a default user profile that includes standard locations for files and templates. Using the Profile Wizard, you can preset options so that users do not have to customize their settings. You can also change default values to match your organization's needs or to ensure that users have access to shared templates. When you deploy a standard user profile, all of your users start with the same Office configuration. 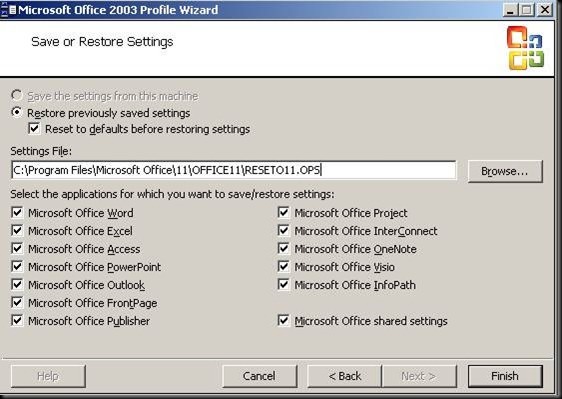 When you save an Office user profile, you create an Office profile settings file (OPS file). You can include your OPS file in a Windows Installer transform (MST file) to distribute the settings when Microsoft Office 2003 is deployed. You can also use the Profile Wizard to help back up and restore user-defined settings from one computer to another. If you need more information please contact the developers of Office Profile Wizard (Microsoft Corporation), or check out their product website.